The celebrations at The Daily Stormer began early on Nov. 9, just hours after the presidential election was called for Donald Trump. And Andrew Anglin, the neo-Nazi who started the website in 2013, was in full-on arsonist mode. Anglin and his confederates had plenty of reasons to celebrate. The man Anglin had endorsed 17 months earlier, in the wake of Trump’s out-of-the-gate description of Mexican immigrants as rapists and drug dealers, had won, shocking the entire American political establishment. The campaign that preceded that victory, with its dog whistles to the racist right, had helped propel Anglin and his movement into public consciousness. Just three months earlier, The Daily Stormer had moved into the real world from cyberspace, setting up a “Troll Army” of activists who follow Anglin’s lead in the vicious online harassment of enemies of his movement. And in July, four months before Trump’s win, The Daily Stormer had become the most popular English-language website of the radical right, eclipsing the Stormfront site that had held that position since the early days of the Internet. The very next day, a new banner went up atop the site: “Andrew Anglin’s The Daily Stormer, ‘America’s #1 Most-Trusted Republican News Source,’ First in Facts — First in Integrity!” Bracketing the site’s new “Republican” masthead were photos of former President Ronald Reagan and President-elect Donald J. Trump. Daily Stormer's traffic began to surge in mid-2016 and continued through the end of the year. The early days of the radical right on the Internet were dominated by Stormfront, a huge web forum set up and run by a former Alabama Klan leader and ex-felon named Don Black. Black had learned his programming skills while serving time in prison for an ill-starred effort to invade a black-run Caribbean island. Black inaugurated Stormfront in March 1995, just a month before the Oklahoma City bombing left 168 men, women and children dead. Over the years that followed, he built up the site to the point where it had hundreds of discussion threads going simultaneously, many of them in sections for languages other than English. The site also benefitted from enormous attention from the mainstream media, mainly because it was the first of its kind and a relative rarity. The site grew slowly at first but then much more rapidly as the white nationalist movement in Europe and the United States expanded. In early 2002, Stormfront had a mere 5,000 registered users, but that grew to 11,000 in 2003, 23,000 in 2004, and so on. By 2015, Stormfront had surpassed 300,000 registered users, although only a small fraction of that number was actively posting. Black tried hard to maintain a relatively non-sectarian environment on Stormfront, and he brought in his son Derek as a contributor and, in 2010, as co-host of the racist radio show that eventually became Stormfront Radio. At around the same time, he began hosting real-world conferences of leading radicals. But clouds were gathering around Stormfront. In 2008, Black’s wife, thought to be a movement stalwart, told a newspaper, almost certainly disingenuously, that she did not agree with her husband’s views. Five years later, Derek Black famously renounced the movement, initially in a letter to the Southern Poverty Law Center. Don Black also angered many followers by trying to ban talk of violence and the use of racial slurs and Nazi symbology. He took sides in certain movement squabbles, alienating some of his followers. In 2014, the site was further damaged by a Southern Poverty Law Center report documenting that registered Stormfront users had committed nearly 100 murders. At the same time, Black’s endless pitches for money were growing tiresome to many of those who had backed him, some of them with major cash contributions. And, most recently, his health increasingly became an important issue. 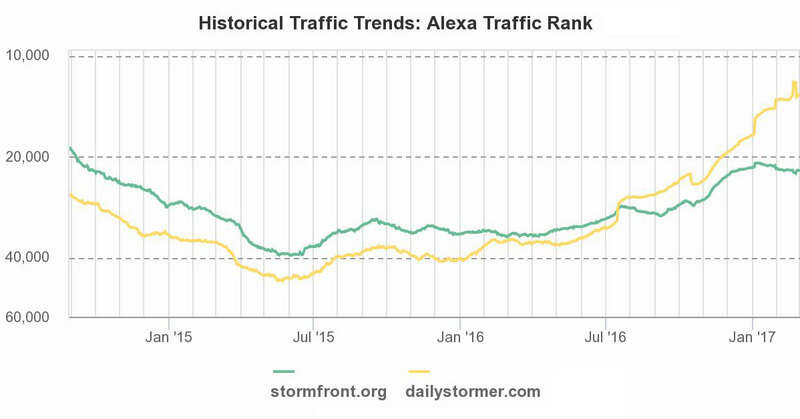 Beginning in 2013 — the same year The Daily Stormer began — Stormfront’s Alexa ranking began to plummet. From a ranking of around the 14,000th most trafficked site on the Internet, it fell to around 40,000th by mid-2015. Another factor, too, seemed critical. Stormfront’s stodgy presentation and clunky features were increasingly behind the times. Meanwhile, The Daily Stormer was featuring flamboyant and eye-catching — if grotesquely racist and guttural — headlines that functioned as “click bait.” In effect, Stormfront looked like an ancient online version of The New York Times, even as The Daily Stormer increasingly took on the appearance and jazzy language of modern news sites like Buzzfeed. Andrew Anglin grew up in Worthington, Ohio, in a family that did not share his later affinity for Nazism. He describes his ideological journey as beginning with an exploration of “all that Communist Jewish stuff” and including an examination of both Islam and Buddhism. But it seems the real gateway to Anglin’s future beliefs came when he started looking at materials produced by Texas radio host Alex Jones, a wild-eyed conspiracy monger who interviewed Trump during his campaign. 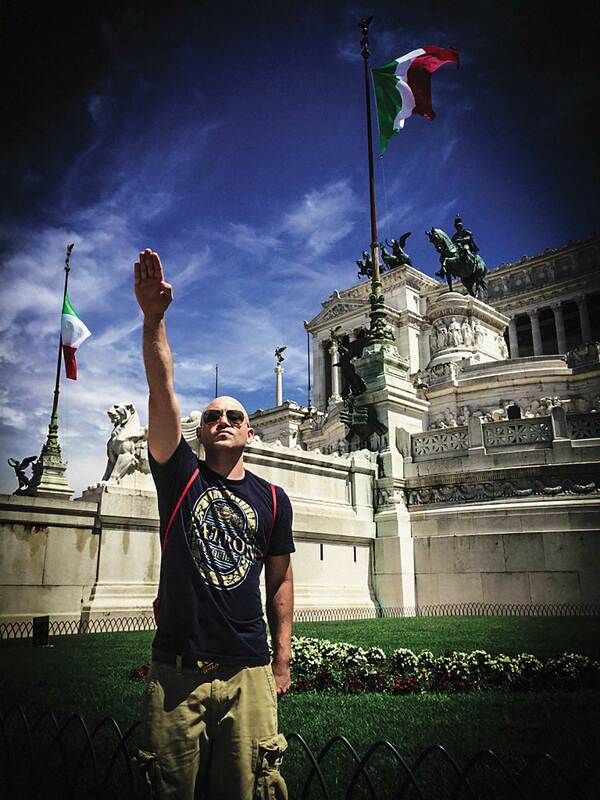 Celebrating fascism: neo-Nazi Andrew Anglin gives the Nazi salute. On July 4, 2013, Anglin started what would become his main project, The Daily Stormer. The site took its name from Der Stürmer, an astoundingly vile and pornographic Nazi newspaper started by Julius Streicher and specializing in attacking Jews. Streicher was later hanged for war crimes at Nuremberg. The new site, created from the ashes of Total Fascism, specialized in punchy, image-heavy stories that often rely heavily on quoted material. It used hyperbolic headlines — “All Intelligent People in History Disliked the Jews,” for instance, or “SS Auschwitz Guard Dies Days Before Scheduled Lynching by Kikes” — to grab readers’ attention, build up participation and shift people’s thinking. One of those who seems to have been “desensitized” to ideas like genocide and race war was Dylann Storm Roof, the young man who murdered nine black churchgoers in South Carolina in 2015 in a bid to start a race war. Posting under the moniker of AryanBlood1488 (the numbers are references to white supremacist slogans), Roof wrote about black-on-white crime — a central topic on The Daily Stormer and Roof’s self-described motive for mass murder. The Daily Stormer is not merely a propaganda shop. Increasingly, it has become a malignant presence in the real world. From the beginning, Anglin encouraged his readers to engage in trolling campaigns against his enemies. An early example came in November 2015, when he launched “Operation: Kikebart,” an attack on the right-wing news outlet Breitbart News after it decided to open a news bureau in Jerusalem. It got so bad that Disqus, a comment platform used by both Anglin and Breitbart, cut service to The Daily Stormer. Other early examples include “Operation: Jew Wife,” in which Stormers were directed to flood the website of conspiracist Alex Jones, who was seen as insufficiently anti-Semitic and who allegedly has a Jewish wife. Another campaign targeted Julia Ioffe, a Jewish journalist subjected to a barrage of incredibly vicious electronic attacks after Trump criticized her for her profile of Melania Trump. The stunt generated headlines across the country. Auernheimer, who goes by the Internet handle of “Weev,” has been increasingly active at The Daily Stormer as Anglin struggles to meet technical hurdles posed by the site’s rising profile. In 2015, Auernheimer bought ad blocks on Twitter and then used Twitter’s metrics report on the success of those ads to gauge how best to popularize certain white supremacist themes. Long before it adopted the motto describing itself as “America’s #1 Most-Trusted Republican News Source,” The Daily Stormer billed itself as “The Most Visited Alt-Right Web Site.” That was a reference to the so-called “alternative right,” a sort of kinder, gentler rebranding of white supremacy for public relations purposes that has picked up a great deal of steam in the last year. The Alt-Right is fundamentally about the idea that societies and nations should be based on race, an old mainstay of the radical right. But most of its self-described activists tend to avoid neo-Nazi imagery and Klan robes, preferring to paint themselves as real intellectuals seeking to solve real problems. Not Andrew Anglin. He specializes in a kind of sophomoric and repulsive humor about topics like the Holocaust. He styles himself a “general,” ordering his Stormer Troll Army into dirty campaigns meant to frighten enemies with threats and insults, often accompanied by publication of their personal information. But he also sees himself as a guardian of the Alt-Right name. In March 2016, Breitbart published “An Establishment Conservative’s Guide to the Alt-Right,” by Breitbart tech editors Allum Bokhari and Milo Yiannopoulos. The story whitewashed the racism at the core of the movement, enraging Anglin. Regardless of these internecine squabbles, the Alt-Right received enormous publicity last year, especially after an August speech by Clinton that lambasted Trump for failing to disavow his support in that movement. One result of Trump’s apparent sympathy for the Alt-Right and Anglin’s adoption of the label was that The Daily Stormer got even more mainstream attention. Three days before the election, Anglin tried to repay the debt. Announcing “Operation No Survivors,” he implored readers to vote for Trump. The goal was for each of his alleged 100,000 readers from the United States to convince five other people to vote for the man Anglin calls “Glorious Leader.” The comment section of Anglin’s Election Day story detailing followers’ efforts to get out the vote reached a total of some 3,000 posts, thick with racist and anti-Semitic memes. On July 18, 2016, The Daily Stormer officially surpassed Stormfront’s traffic totals, making it the most popular English-language radical right website in the world. Andrew Anglin had successfully used computer and communications savvy, rising right-wing populism, the Trump phenomenon, and his own signature vulgarity and aggressiveness to displace Don Black, for years arguably the radical right’s most longstanding and respected cyber-leader. Few had seen it coming. Whether or not those “successes” will continue for The Daily Stormer, which has certainly benefited from the country’s political situation, is not clear. One problem for Anglin is that prominence on the radical right, combined with the power of the Internet, has not always worked out well for racist leaders.